Pak Choi is no longer one of those ingredients which require thousands of food miles or a trip to your specialist market to get within your grasp. It is plentiful, and whilst it may be concealed in a random location at your local supermarket, is likely to be there. Depending on where you shop, it might be easier to find those missing WMDs than it is to find a member of the store’s staff who knows what pak choi is. It is part of the cabbage family (but so much more tender), and, a bit like Carlos the Jackal (without the trail of destruction) goes by other names, notably: bok choy, horse’s ear, Chinese celery cabbage and white mustard cabbage. Think of it as somewhere between mild cabbage and spinach, but not quite there. Pak Choi is typically steamed or stir-fried – both methods I think are great. One of my favourite (and recently discovered) methods though is roast in the oven. One could argue that as minimal oil is used, is it baked, or roast? The jury is out. Being somewhat aggrieved by the cost of utility bills like most of us, I am always looking for an opportunity to re-use energy when I can. 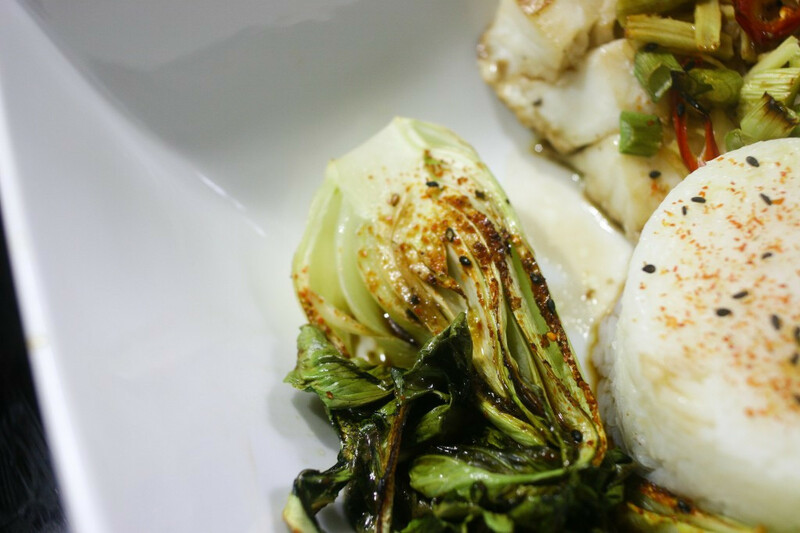 Rather than fire up a steamer and cook separately, I happened to be baking cod loin in foil, and thought, why not add the pak choi to the roasting pan? It could not be simpler- better still – the leaves start to absorb the flavours of other ingredients which is a considerable bonus. It is a great accompaniment to many dishes where you might normal try spinach, broccoli, beans or other things. line a baking tray with foil, mist with oil, and heat in the oven whilst it is warming up. cut the pak choi down the middle, and once the oven has reached temperature, remove the tray and lay the pak choi halves on it with the middle facing upwards. drizzle the olive oil and soy sauce over the leaves, and sprinkle the Nanami Togarashi. Return to the oven and roast for 15-20 mins. Personally, I like it more when some of the leaves start to crisp up a bit. I’ve only ever had pak Choi steamed, stir fried or in a noodle soup. This is inspired- I’m going to surprise my parents with this next week when they stay over. This is produce they grow up with- so let’s see. I remember when Pak choi was hard to find… Now it is grown in the UK and far easier to get hold of. I came up with the idea a good couple of years ago… High time I cook it again. Enjoy!